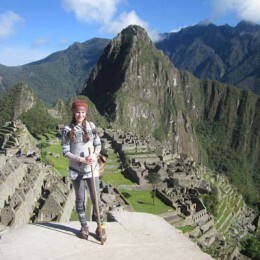 At 5 am on December 20, 2012, we set out on a journey in Peru on a stone path made more than 500 years ago. 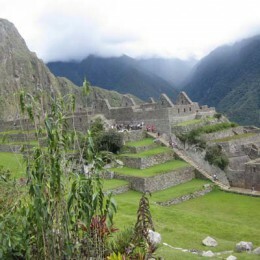 It winds through the Andes alpine tundra and cloud forest more than 4,000 metres above sea level, along cliffs and above clouds. 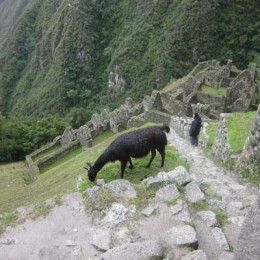 It was once the path of the Incas and led to their glorious city in the mountains above the Urubamba Valley—Machu Picchu. 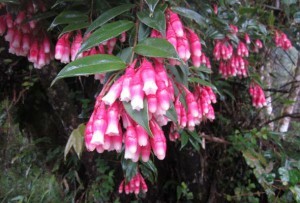 During the Spanish conquest in the 16th century, the site was abandoned and forgotten by the outside world, left alone for hundreds of years until it was rediscovered in 1911. 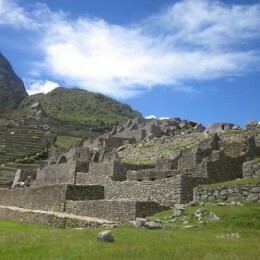 The purpose of the site is still unknown, but many believe it was built as an estate for the Inca emperor Pachacuti (1438-1472). 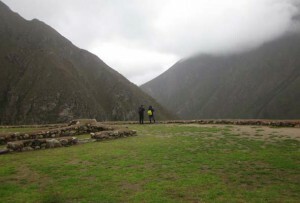 Evidence suggests the site was selected because of its position among mountains, which have features that seem to line up with key astrological events, giving the site powerful energy and making it sacred. I was hoping to get in on the whole spiritual, mystical energy thing. I was hoping the mountain energy would somehow give me a boost onto the oh-so-trendy train of spiritual enlightenment. If anything, I needed a slap in the face. Irwin, 69, and I, 31, considered ourselves to be in reasonably good shape. I knew a four-day, 45-kilometre was going to be challenging, so I upped my yoga routine weeks before to prepare physically and mentally. 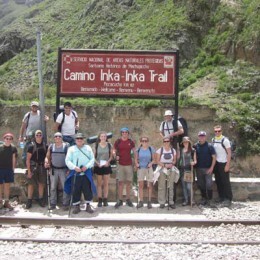 A two-hour bus ride from Cusco took us to the marked beginning of the Inca trail. We got off the bus and prepared ourselves for the journey—organizing our bags and smearing on sunscreen while scoping out—I mean introducing ourselves—to the rest of the group. There were 16 in our group and the ages ranged from 18 to 69. These were no couch potatoes. 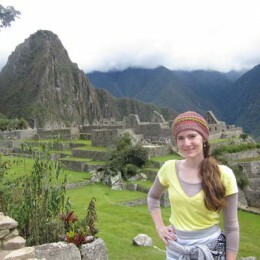 Everyone looked like exceptionally fit and experienced hikers. This did not scare me. I may have been the scrawniest of the bunch, I’m no Serena Williams, but I’ve got fight, endurance, and great breathing exercises, thanks to my yoga classes! We lined up, got our passports stamped, crossed a bridge and set on our way. 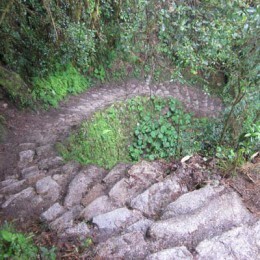 The first three minutes of the path were on a steep slope. I was already putting my breathing exercises into practice. I looked back at Irwin. He was breathing heavily. Altitude is no joke. This wasn’t even a taste of what was to come. Rain clouds slowly covered the sun and for the rest of the trek, with the exception of a few hours here and there, it rained. I pulled out my one-size-fits-all bright yellow dollar-store poncho, which under normal circumstances I wouldn’t be caught dead in. This was no time to worry about looking cute. Unwritten Rule No. 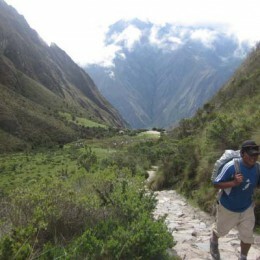 1 of the Inca trek: Whatever gets wet stays wet till the end. 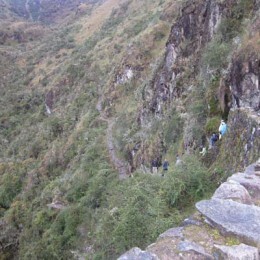 The path led us through dazzling mountainous terrain, Inca and pre-Inca ruins. 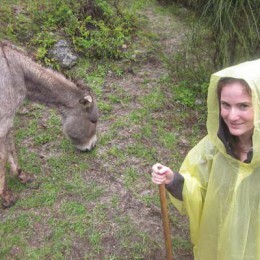 There were a handful of houses with domestic animals—donkeys, llamas, horses and lambs. Our guide Jhonnatan was very friendly, helpful and knowledgeable. We rested at each site as he explained its history and importance. 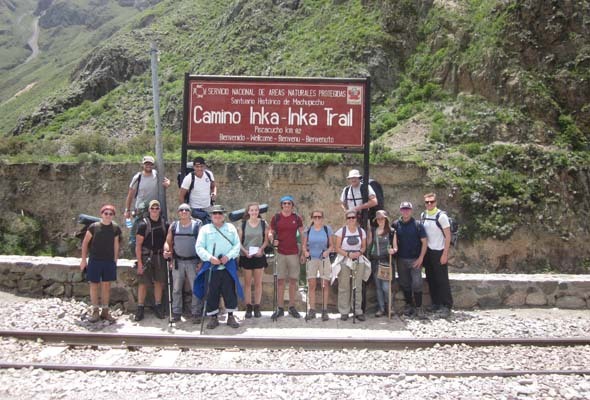 The first day of the Inca trek is considered to be a “warm-up,” as the difficulty level increases tremendously on Day 2. By the time we arrived at our campsite in the evening, Irwin was tired, to say the least. He had a difficult decision to make. The porters set up camp and prepared a delightful dinner, which included dessert. No one goes hungry on this hike. We all ate together in a communal tent with our flashlights as the only light source. 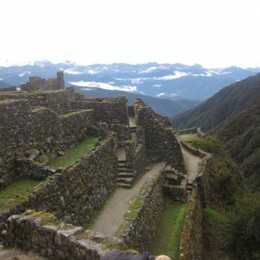 As an inexperienced camper, I wasn’t attentive to the angle of my sleeping position, and unconsciously slept parallel to the slope of the ground, slowly rolling down to the other end of my tent as I dreamt of my previous life during the Incan Empire. Despite this, I slept marvelously. The next morning Irwin turned back, proud that he had made it that far. 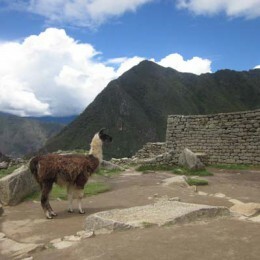 We later found out that people his age rarely attempt the trek. 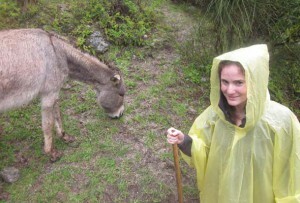 Day 2 was grueling, to put it mildly, and my dollar-store poncho had soon become my most cherished belonging. It was mind over matter. I had to keep my rhythm, be it slow. 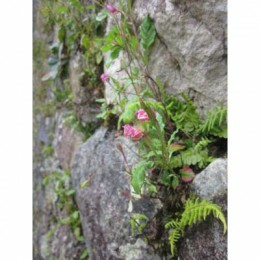 We spent hours climbing uneven jagged stone steps as it rained. Each step was a tremendous effort. The altitude was hitting me hard. I don’t know about spiritual energy, but I certainly got a slap in the face. I cursed every step. Two hours into our hike I was about to sit down. I felt alone, hopeless and exhausted. Things were looking bleak. My group seemed far ahead of me. Jhonnatan came up from behind. “C’mon, senorita! You’re doing so well!” It’s amazing how far a little encouragement goes. 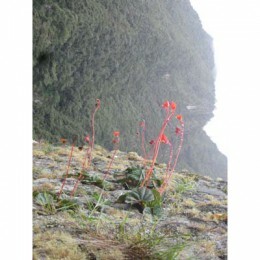 It got me back into my rhythm, and all the way to the highest peak, “Dead Woman’s Pass” at 4,215 meters. No pun intended. The views were dramatic. For much of the day we were looking down at the clouds. 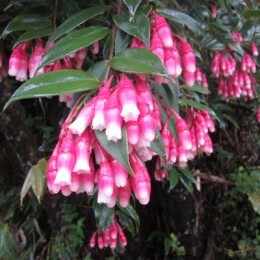 We came across the most spectacular scenery on the third day, as we trekked through lush vegetation, bright flowers and stone tunnels. Trees poured over the path as it ran along cliffs that dropped down endlessly on the other side. Most of my group raced ahead while I took my sweet time, lingering behind. Cristian and Fernando lingered with me. I wondered if they were basking in the beauty as I was. Or were they helping me reach the finish line? 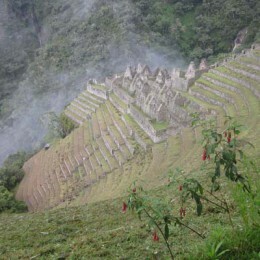 The last site we came across was Wiñaywayna—an ancient little village on the side of a mountain that once housed about 50 people. 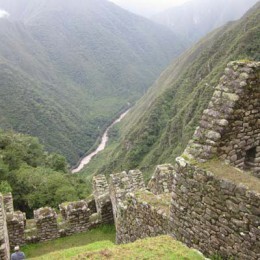 It was a mini Machu Picchu. 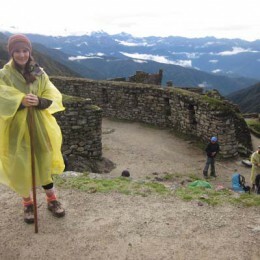 Looking like a bright yellow parachute in my trusty poncho, I sat alone on an old stone wall. It was December 22, 2012. Cut off from civilization, I wondered … did the world end? 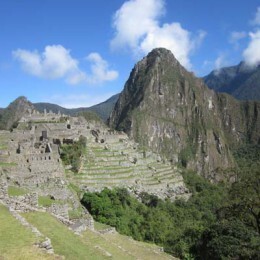 Did the sacred mountains protect us from the apocalypse? Were we the sole survivors? It was so peaceful, with sounds of light rain hitting the stones. Some flowers grew out of the cracks. 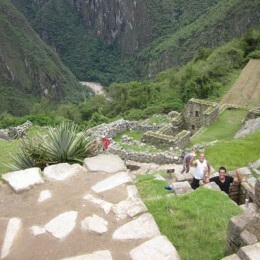 We woke up the next morning at a painful 3:30 am and hiked to the Sun Gate for our first glimpse of Machu Picchu. 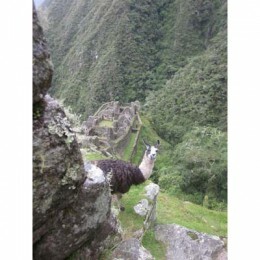 It was masterfully perched on a mountain with cliffs dropping 450 metres down to the Urubamba River. The sun shone perfectly through the mountains and onto the site. I thought I would feel something magical, to pick up on that sacred energy. But alas, I just wanted to take a shower. 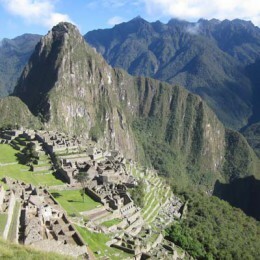 And though Machu Picchu was impressive, the most magnificent part of it was the journey to get there. 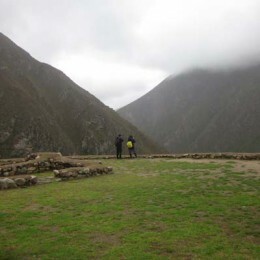 The breathtaking archeological wonders, the everlasting stone path, the porters who so effortlessly ran through the mountains with 30 kilograms on their backs, not to mention my actual completion of the trek, is a testament to human strength, both physical and mental. 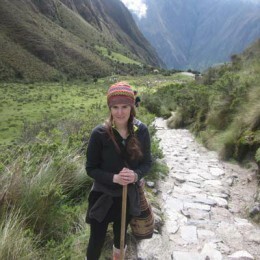 1 Comment on "Peru’s Inca Trail: Walking in the footsteps of the Inca"
Oh that was beautifully written!